The Ranier house at 321 Wilson Avenue was designed in 1937 by architect Lewis Dunn of Dunn and Quinn, and built by the contractor, T. Miller and Sons, for oilman Mr. Lee Welch and his wife Valverde. Lee Welch was a business leader and principal in the oil firm of Vincent and Welch. It was one of Mr. Dunn’s first houses, and he went on to design many local schools and houses including one for Mr. Vincent, in a long and distinguished career. The original plans show that the house, a rectangular two storey white painted brick, was designed and built in the Federal style. The front of the house featured a diamond shaped window set in the triangular stucco cornice on the central protruding part that included the front door, hall and curving staircase, and upstairs landing. There were two octagonal shaped windows in the wings on either side of the front door which were later walled over. The rectangular transom is decorated with leaded glass with an undulating oval motif. The front door has a curved pediment embellished with dentil moulding and fluted pilasters on both sides. It also has a waist high door knob in the centre of the door. The house had no front columns. The home is distinguished among other things by the attention to detail and the craftsmanship of the woodwork, and rounded architectural features which add interest and charm, such as the curving staircase and the sloping hall wall. Upper casement windows have composition rosette and wood fluted pilasters. The dining room and game room had garden facing doors with glass brick panels on either side which were later walled in. The two car garage was on the north end of the house but was later converted into a den. The living and dining rooms have wainscoting and cool plaster walls. The living room fireplace is wood and marble and the bank of windows overlooking the garden is curved. The game room is paneled and shelved and, with its spare wooden fireplace and mantel, it has a Georgian simplicity of form. In the early 1940’s the house was lived in by the Taussig family for a short time. The Taussigs were leading business people and the parents of Jimmy and Alice Taussig. 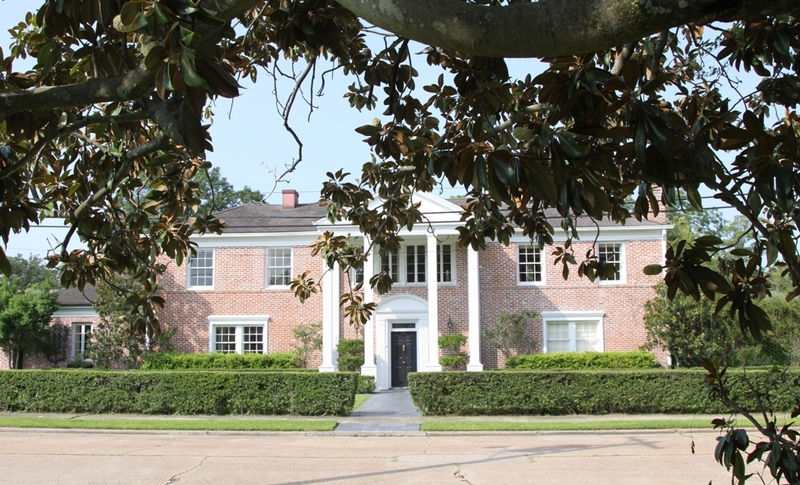 The house was bought in 1943 by oilman David Garrison, Sr. and his wife Marie (nee Gardiner) with their children, David and Katherine (Ducky). They made significant changes to the home, moving it away from its Federal beginnings to a more Southern, antebellum look. 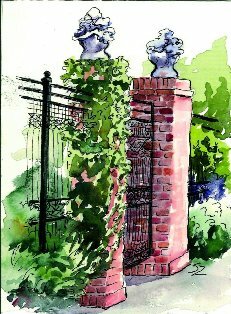 A 1945 landscape plan provides for the design of the ten foot high wall which encloses most of the back yard. 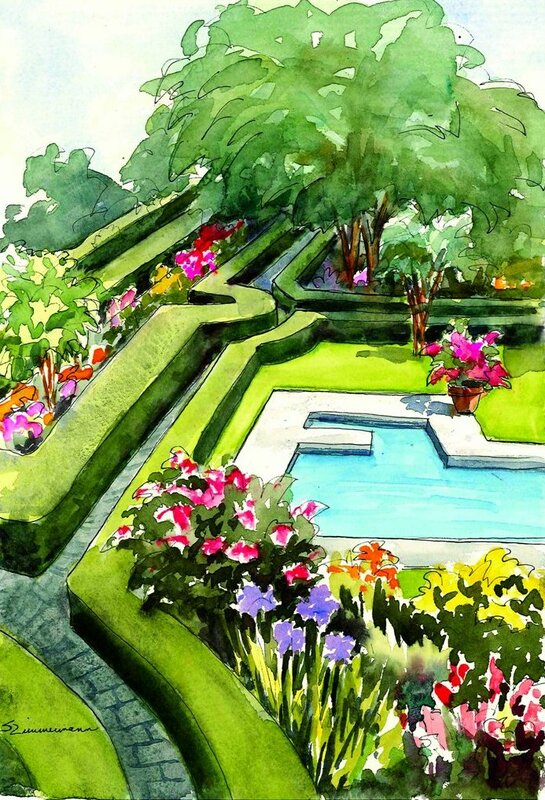 In the mid fifties, Mrs. Garrison embarked on a two year renovation of the house and garden. Rene Lambert of the Lambert Landscape Company of Dallas, Texas, redesigned the yard and some features of the house itself. It was on Mr. Lambert’s advice that changes were made to the front of the house. The roof of the protruding front section was extended to create an eight foot portico and four tall, fluted, square wood columns were installed to support it. The fluting reflected the original pilasters on either side of the front door. The diamond shaped window near the apex of the roof and the octagonal windows were removed. The entire house, inside and out, was painted Lambert green. Wallpaper was also that color, and the wall-to-wall carpet was dyed green at the factory. The elegant double doors into the living and dining rooms had carved pediments with ornamental pineapples put above the doors on both sides, and new, elaborate baseboards and ceiling mouldings were installed. The local firm of Davidson, Sash and Door worked exclusively on the house for two years. The firm of Dunn and Quinn was again brought in and architect Pat Gallaugher designed renovations and improvements. The two car garage was converted into a den, and a three car garage with attached living quarters was built in the rear courtyard. Mr. Gallaugher also designed the garden pavilion at the rear of the walled yard. The half moon shape of the pavilion echoed the curved wall of the living room across the lawn. The screened porch was incorporated into the kitchen and a blue slate terrace and wooden arbor were put around the house. The whole of the yard was excavated to a depth of three feet and top soil and new plants were brought in from Dallas by Lambert Landscape Company. One of the most spectacular events to take place at the house was the wedding of Katherine ‘Ducky’ Garrison to Ronnie Brewer around 1959. Lambert brought in a fleet of eighteen wheelers, and a large work crew, and effected a complete transformation of the yard working overnight before the wedding. There were dense beds of flowering hydrangeas, camellias, white tulips and dozens of large potted plants in full bloom. The flat roof terraces were solid with blue hydrangeas which did not please Mrs. Garrison, so they were replaced with pink ones. The bridal couple had just graduated from high school, and guests at the wedding still remember the Hollywood-like setting with a crowd of beautiful young people, fountains everywhere, ice sculptures, masses of flowers, and huge servings of caviar and champagne. Maureen Miller was the interior designer for Mrs. Garrison who also had help from her brother Jimmy Gardiner, a successful Broadway producer. Mrs. Miller’s photograph album from that time shows luxurious interiors with antique filled rooms, wall to wall carpet, heavy draperies and upholstered furniture. At the time of the Cuban missile crisis, Mrs. Garrison consulted Mr. Gallagher about building a bomb shelter, something very much in demand at that time, however the project was ultimately abandoned. Mrs. Garrison is also famous for sending crews of men to scour land in north Louisiana for a huge live oak for the front yard of the house. One was found, dug up and planted at a cost of five thousand dollars – an enormous expense at the time. The live oak did not survive so she sent another crew to find a Southern oak, which had better luck and survived till Hurricane Rita. In 1964, Patsy Dunn Moore, daughter of Lewis Dunn and future wife of architect Charles Moore, came with her St Charles Academy graduating class to have their yearbook pictures taken in the garden of the house which her father had designed many years before. 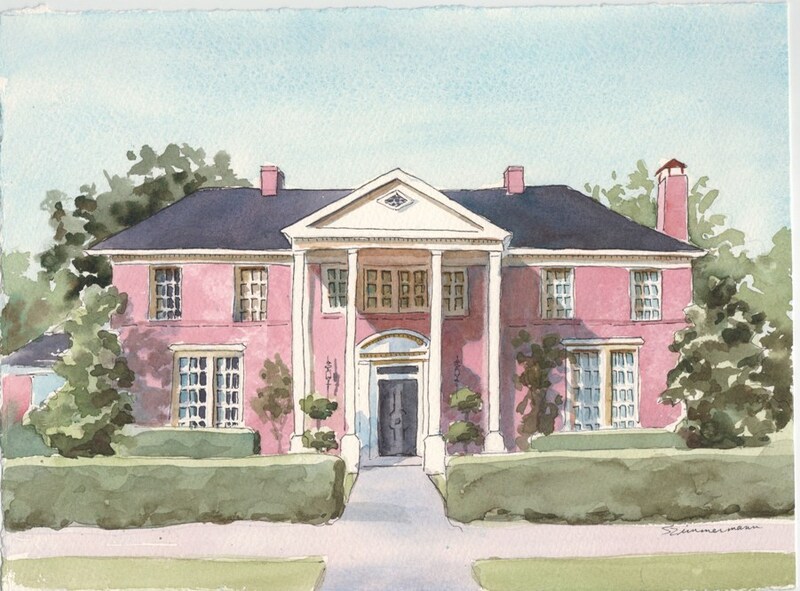 In Mrs. Garrison’s lifetime the house was a glittering center of Lake Charles social life. Her portrait graced the living room fireplace and there was a constant stream of guests to the house. She did not like to be alone. On her death, Mrs. Garrison lay in state in an open casket in the dining room of the home. During the wake in her honor, large numbers of people came to pay their respects and reminisce about her life, and stayed late into the night just as they had in her lifetime. In 1983 the house was bought by Janey Barham Lee, who was a childhood friend of the Garrisons, and was very familiar with the house. Both daughters, Elizabeth and Jennifer, who grew up in the house, and one son, Barham, now live in Margaret Place. She made significant interior improvements, especially to the bathrooms and dressing areas. The flat roof balcony next to the master bedroom was incorporated into the house and became a dressing room. Outside, the green paint was sandblasted to reveal the original bricks of the house, and the trim was painted white. Drew and Sheila Ranier, the current owners, purchased the house in 2000. Under the direction of architect Charles Moore, the son-in-law of Lewis Dunn the original architect, and with contractors Alvin Miller and Mike Guglielmo, the house was completely renovated including wiring, plumbing and air conditioning. The kitchen was extended and completely redone and a carport and recreation room were added. The recreation room’s curved wall is in harmony with the curved architectural features of the home. The outside has dentil moulding characteristic of the house. Mr. Moore also designed the stone pool and spa and replaced the upright supports of the pavilion with Doric columns. The garden was landscaped by Terry Parker, and included planting of trees and shrubs and the restoration of the formal hedges along the pathways. Garden lighting was designed and installed by Randy Lanza of Joseph’s Electrical Center. The diamond shaped window, found in the attic, was reinstalled in the cornice. The columns under the portico were strengthened by being set in three foot high footings. The garden facing single doors of the dining room, study and den were replaced by French doors into the garden, during the course of which the original glass brick panels were found in the wall. The transoms over all the casement windows were cleared of the painted wood covers, and Georgian style grates were installed in the living room and study fireplaces. The butlers pantry and sitting area adjacent to the kitchen feature cork floors, and a new marble floor was laid in the study. An elevator was installed with a red leather padded door, and a floor and ceiling were designed and painted in faux marble finish by Gary Breaux. The den was remodeled. Its old casement windows were converted into a dropped light ceiling panel in the kitchen, and a new stone fireplace was installed, as were pecan bookcases and cabinets made by Lynn Boddie, and stained glass doors by Frank Thompson. The downstairs powder room, study and butlers pantry have William Morris wallpaper. The powder room floor is original black and white tile. Frank Thompson also made the interior stained glass windows in the office and kitchen. The kitchen features an antique gas stove. Most of the original features of the house have been preserved, including bathrooms tiles and floors. Great care was taken to preserve the character of the house imparted by prior owners over the years. 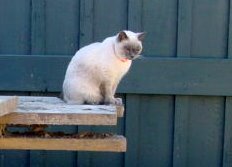 One of the most important occupants in the history of the house was a small blue point Siamese stray who moved in during the Ranier renovation. She adopted the house and no amount of construction mess, noise or dust deterred her. She presided over the weekly project meetings sitting comfortably on the plans. The house was finished around her and she was its first occupant. Her name was Pearl. She was very much adopted by the construction crew. 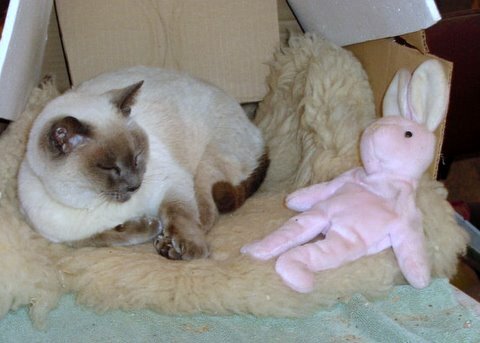 The pictures below show Pearl on the job and in her makeshift bed of cardboard, an old sheepskin rug and a rabbit toy one of them brought her. Over the years the house at 321 Wilson Avenue has been a much loved home to a diverse group of Southwest Louisiana people who have made significant contributions to the business, social and civic life of the area. It has played an important part in the history of Lake Charles, and hosted many important functions for a wide range of civic and social purposes. The photos below were scanned from photos of the original owners. Several were taken when the home was under construction or recently completed. Be sure to note the photo of the Lake and the ones taken during a rare snow storm! Click on the first image to make larger. By hovering over the upper right hand corner, "Next" will appear. Click on "next" to advance the next photo.